I have to admit that since having a small tyrant person on board, the whole retail experience has become somewhat different. When they are tiny it’s sling them in a sling or pop them in the buggy, and as long as your destination has changing facilities, it’s all pretty simple. You can still eat, shop, and baby cinema is awesome until they are at the crawling stage! However, once they are mobile it can be a whole different ballgame. To keep everyone happy (him, us, the general public) try to think ahead for days out and plan it a little. We’ve found that Westfield is particularly family friendly and the east London one is near us. We usually tend to head for the “John Lewis end” ie the opposite end to the station. This is how we handled a recent day – ie 3.5 strategically spent hours – at Westfield Stratford City. Get there early. Turns out that Westfield is indeed open at 9:00 on a Saturday (I thought it was 10:00) and this extra hour of bimbling about is invaluable. At 19 months, Sproggett likes nothing better than to leg it off into the distance, which was fine when it was empty and it helped to burn off a little energy. The guy in the Phones 4U shop was also very patient as Sproggett spent ten minutes cooing and pointing at all the handsets, because the store was still empty. Again, this works if you’re there first thing before it gets busy. Take child’s hand firmly. Do the roundtrip of the travelators 8-10 times for pure child glee – while staying out of other people’s way, obviously. Like getting there early for exploring, this uses up some extra energy. If there are two parents or carers, one of you does this while the other sorts out the vehicle. Like a lot of things pre-baby, I kind of wondered if those little car trolley things were really necessary. Answer – possibly not necessary but definitely a nice to have. 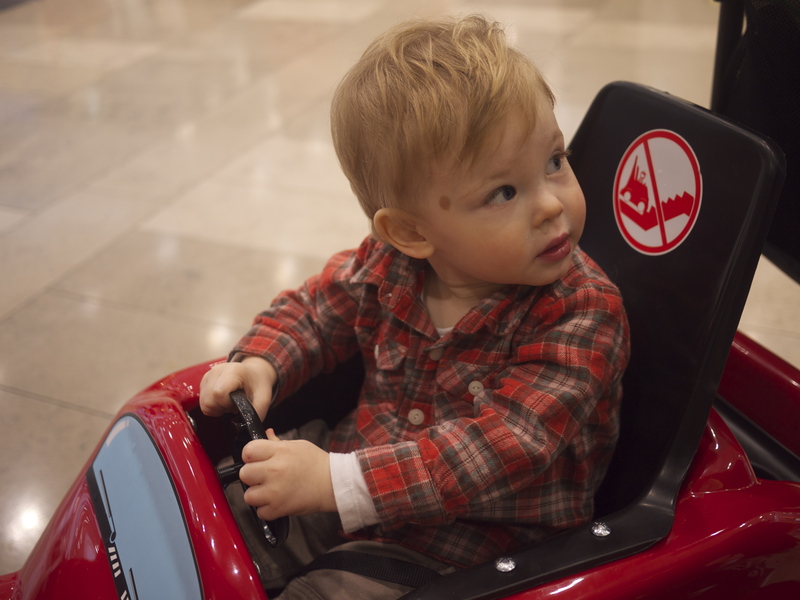 It costs £6 to hire a Kiddy Car for a day, plus a £2 returnable deposit. Ample shopping bag and coat storage space too. Before I’d finished filling in the forms, Sproggett was ensconsed and pretending to be Jensen Button. Easier to steer than you’d think but do remember to take the brake off (doh). Following on the Formula 1 theme, we have mostly given up leisurely brunches (so no Balan’s this trip) in favour of quick treats along the way. At 19m it’s difficult to keep him in a seat for too long so this works better. We started with coffee, and for Sir, a pain aux raisins from Grind, or ‘my Stratford office’ as we know it because I often have meetings here. It’s a very decent indie Kiwi coffee shop that roasts its own beans. I have frequent daydreams about their halloumi salad from the lunch menu. Child is brandishing one of their loyalty cards – eight drinks and the ninth is free, and they also offer a smartphone loyalty card. 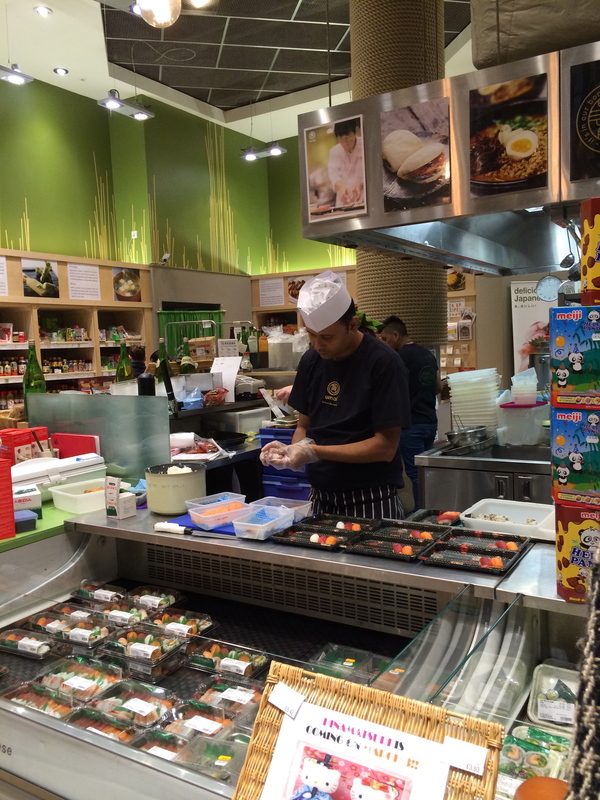 Just before we left, we stopped by Japan Centre to pick up fresh sushi to take away, as it was nearing nap time. I wanted to buy the amigurumi needle felting kits too – they sell everything! First stop, Foyles, which happens to be right by Grind. 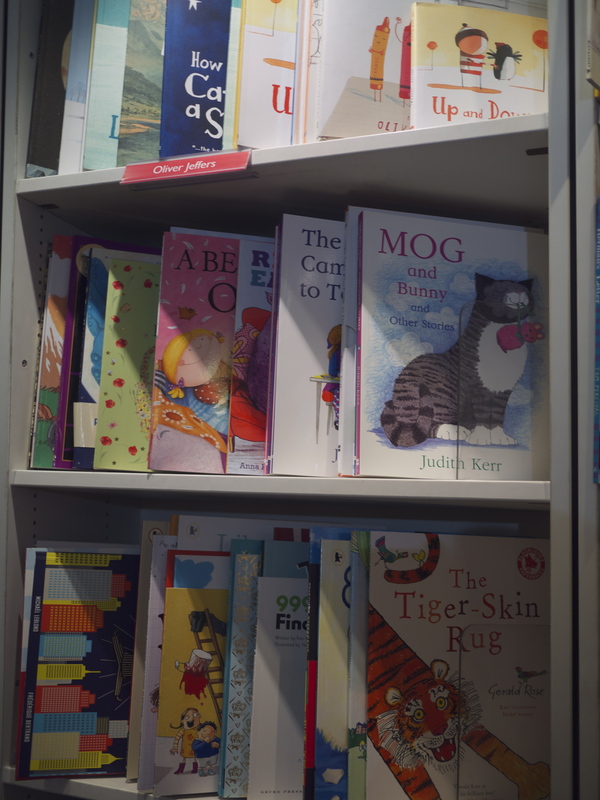 In fact one of you could still be finishing your coffee while the other one moseys on in with the kid… it has a lovely Children’s Department, complete with a cosy corner to sit in and soft toys to keep you company while you try out the books. Again, grab their ‘Foyalty’ card to earn points on your spend. 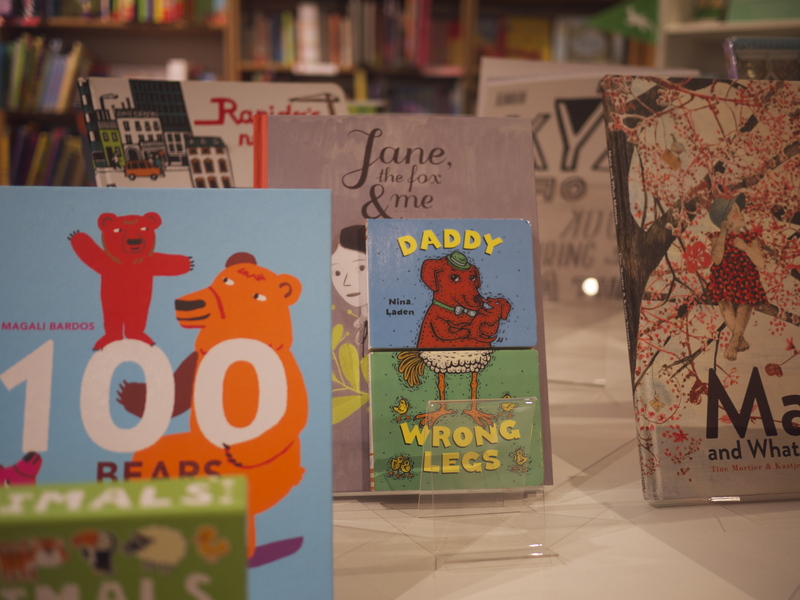 We bought some lovely board books including the brilliant A Deal’s A Deal, from the amazing Stephanie Blake who also wrote Poo Bum, a current favourite. Next pop by Playworld, a small indoor playground which is a fun diversion for a few minutes, for kids under 5. 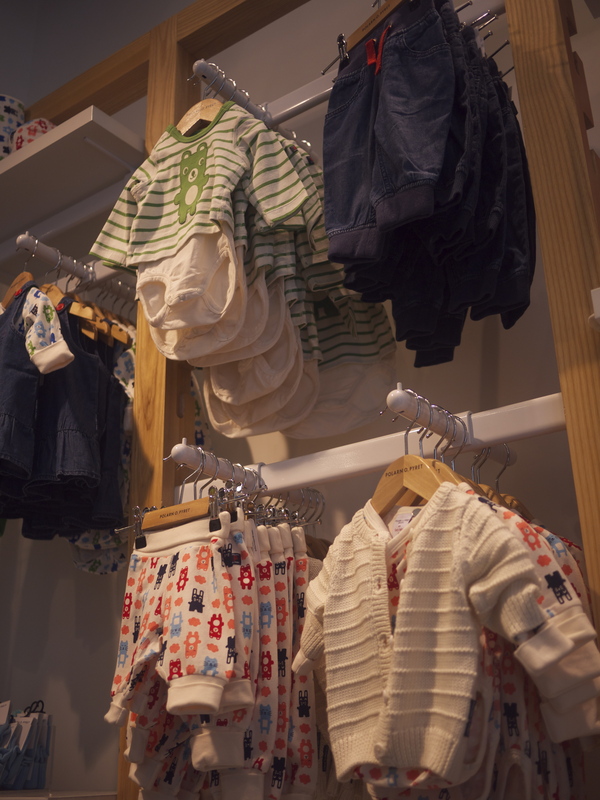 After that, it was Mothercare and one of my favourite kids clothing stores, Polarn O Pyret. We have bought, borrowed and been gifted various pieces from their layerable winter ranges and it’s great quality. I also like that they use lots of bright colours in supercute designs suitable for boys or girls. Plus they have a train track in the store for kids to play with while parents browse. Look at the beary trousers for tinies! 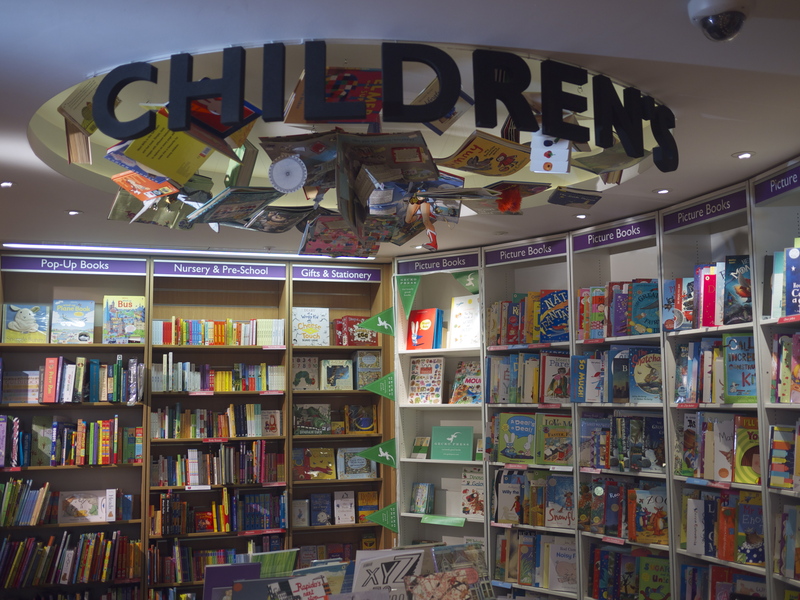 Given that a lot of the kids’ stores are on the ground floor at the same end of the centre, it’s easy to pop into a few in a relatively short space of time and without any sign of a toddler meltdown at all (ie our definition of a very successful shopping trip.) There’s a number of toy shops, and when Sproggett is older, I imagine that he and his Dad will be spending more time in the Lego store! 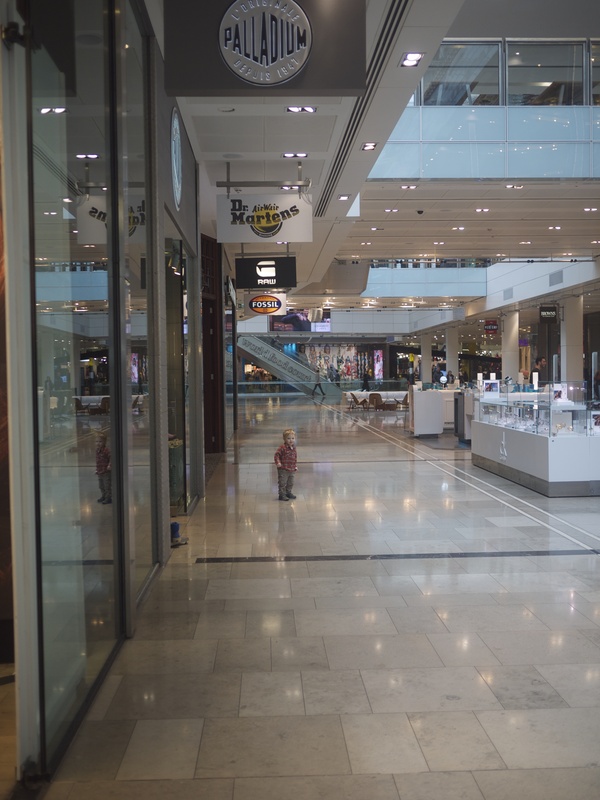 In short, Westfield works really well for us when we’re going shopping as a family (and the parent rooms, with changing and feeding facilities including separate rooms for breastfeeding, are really useful, and there are similar amenities in John Lewis). 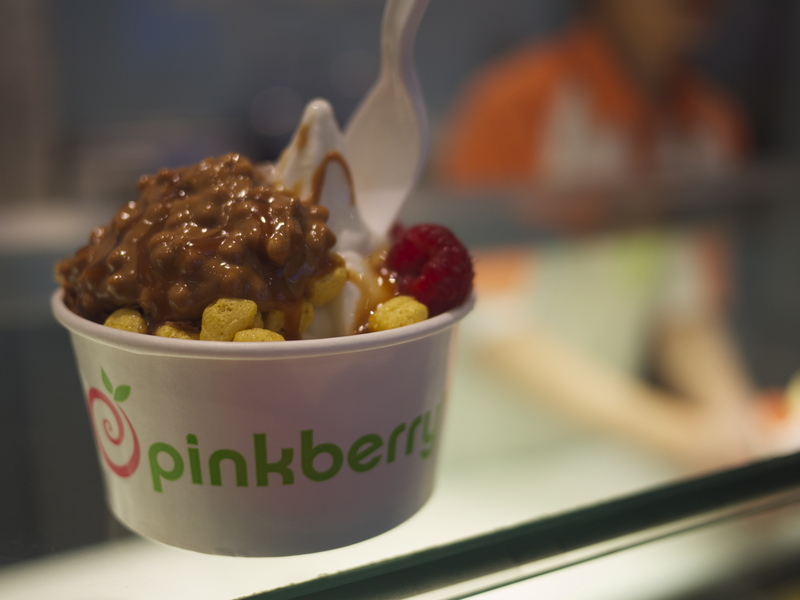 And it’s not just because I can get my Pinkberry fix. Disclosure: We were invited to visit by Westfield but the review is entirely my own opinion.